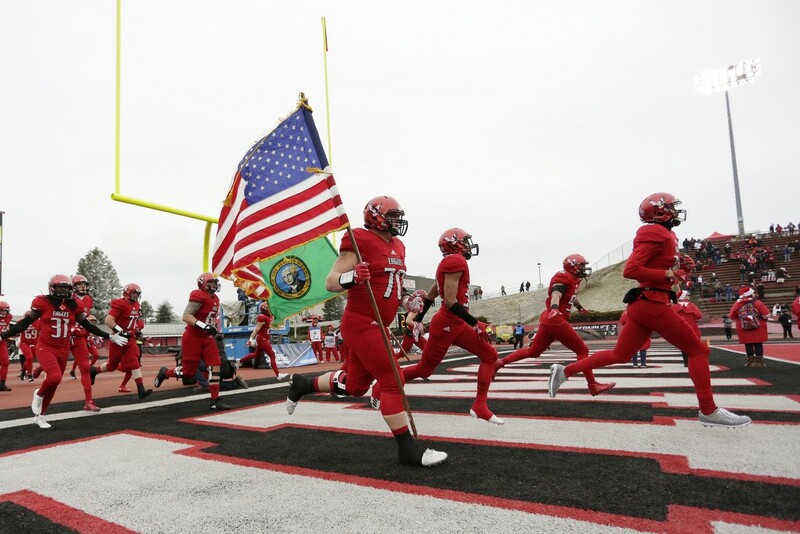 Eastern Washington offensive lineman Matt Meyer (70) and his teammates run onto the field in Cheney earlier this season. They almost did it. And damn it, that counts for something. After a big season, the Eagles will throw down with a celebratory rally at the River Park Square Mall atrium on Saturday, Jan. 12 at 2 pm. Mayor David Condon and the Spokane County Commissioners will deliver a special proclamation about the team. The Eagles’ mascot, Swoop, the cheer squad and band will also be at the event to celebrate the Eagles' 12-3 season. Eag Nation is invited to River Park Square in Spokane this Sat. at 2 pm as we celebrate the @EWUFootball Season! Special guests to the event include head coach Aaron Best and the football team, EWU President Mary Cullinan, EWU Associate Vice President/Athletic Director Lynn Hickey, among others, and long-time EWU announcer Dave Spencer will serve as emcee, a press release says. The Eagles lost to the undefeated North Dakota Bisons in the FCS Championship Game last weekend in Frisco, Texas.